This event is sold out. Please check back for the 2020 James Beard Luncheon, details to come. Just like any good wine, cheese, or cast-iron skillet, the James Beard Gourmet Four-Course Luncheon, a special feature of Palm Desert Food & Wine, only gets better each year. 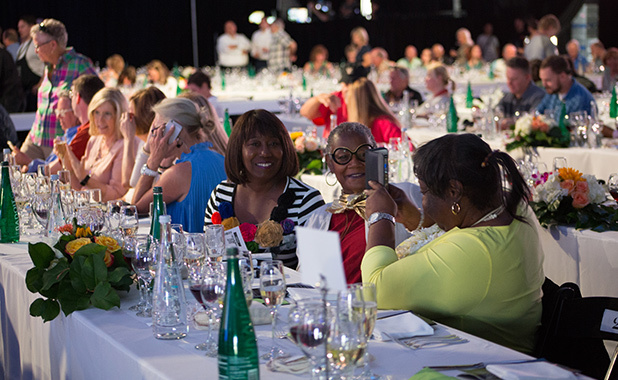 The lineup of award–winning celebrity chefs that will be attending the 2019 event hail from California and across the country and include Scott Conant, chef, restaurateur, cookbook author, TV personality, a judge on Chopped, and frequent co-host on Food Network’s Beat Bobby Flay; Fabio Viviani, acclaimed chef, culinary personality, restaurateur, cookbook author, and winner of Top Chef‘s Fan Favorite title; Antonia Lofaso, chef, restaurateur, cookbook author, and television personality on Top Chef, Restaurant Startup, Cutthroat Kitchen, and Food Network’s Guy’s Grocery Games; and Zac Young, named one of the top 10 pastry chefs in America in 2015, creator of viral dessert sensation The PieCaken, finalist on Bravo’s Top Chef: Just Desserts, and Pastry Director of Craveable Hospitality Group. A portion of the proceeds will be donated to the Friends of the James Beard Foundation and to Coachella Valley’s FIND Food Bank. Paired with The White Knight 2016 Pinot Grigio, Delle Venezie I.G.T. Because alcohol will be served, you must be at least 21 years of age to attend Palm Desert Food & Wine™ events and to enter the tent. No accommodations are available for individuals under 21 years of age.